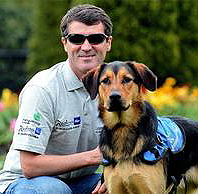 Ten years on from the infamous Saipan Incident Roy Keane was back in Ireland in May 2012 to to fulfil his annual commitment to promote the Irish Guide Dogs for the Blind charity. Mick did send you home? That's what he said at his press conference. Keane: That's not true. Was this the press conference that was done within half an hour of the private meeting with, what's his name, the lad who organised the media? Piss-up in brewery springs to mind, but there you go. I had a disagreement, if you remember, with one or two of the goalkeepers because they didn't want to train. Y'know, if you don't want to train a couple of weeks before the World Cup . . . it doesn't surprise me why these players didn't win too much in their careers. And that's not being disrespectful, that's a fact. Even when I came back with Ireland, I passed (John) Delaney in a few hotels in Paris and he wouldn't even say hello. Listen, obviously it takes two to tango, I know that. Considering the question marks over me with Ireland, I played 60-odd times and when you look back on my injuries, I still think that wasn't a bad return. And the most important thing for me is that when I did play I always felt I did okay. Thanks to the Irish Times for the kind permission to reproduce the above from reporter Mary Hannigan's piece in the newspaper on Friday 4th May 2012. Journalist Malachy Clerkin assembled the following views on the Saipan Incident ten years after the event and they appeared in the Irish Times on Saturday 13 May 2012. Thanks are due to Malachy and the Irish Times for permission to reproduce them here. I felt I knew Keane better than other people. John Giles and Liam Brady would have had certain views on him. John is fascinated with him still, Liam was just scathing. I can't fathom why. None of the three of us are particularly nationalist but John and Liam couldn't get past this thing of his not being prepared to wear the jersey. Michael Kennedy got me to ring him when he was back in Manchester. He asked what should he do and I told him to do the Tommie Gorman interview because television has no filter and he'd get his side of the story out. I basically decided to have fun with it all. I was kind of immune to being disliked by people insofar as any human being can be. So I said to Jane, 'Wait til you see what I'm going to wear tomorrow'. And I dug out a green shirt - which I still have - and a red tie. Cameroon colours. I wanted to get away from all this seriousness. There were people dying in hospital and this was nothing compared to that. So I arrived into RTÉ and there was absolute consternation. Nobody wanted me to wear it, none of them thought it was a good idea. I just did it. I'm not crazy, I'm just going to do what I want to do. It's supposed to be fun, it's not life or death. Most press people came and waited for his return and got the pictures of him walking with the dog, Triggs, and then went home once the weekend came. But we stayed and we were the only ones who stayed. We were on the phones with Michael Kennedy asking would he do an interview and just asking and asking again. The Aprés Match boys and the rest of the piss-takers and chancers made a living out of the question about the kids - 'What about the children, Roy?' And good luck to them. But for me, that was the absolute way to get at Keane. I was standing outside his house when he got back from Saipan, after flying through the night. And as he went through the gates and up his drive, you could see his kids pulling back the curtain from the upstairs room and looking out to see their father coming home, as children do. I said it to him afterwards. And he said: 'Ah, that'd be them waiting for presents.' Which was probably not the case - it was a straightforward love thing, that Daddy was coming home. He had this jaundiced view of himself and I reckoned that this was the way to get him thinking about things, to get him to step outside it and think, 'What the hell is this all about? What the hell is going on?' Because the one thing you'd always have to say about Roy Keane is that all his life he's been a fantastically responsible person when it comes to the marginalised. I'm convinced and I'll go to my grave believing it that Keane wanted to go back. I know that he sat up that night watching the coverage on Sky News and the first thing that came back was the disastrous statement from the players that wasn't supposed to be released. It was over then. It was front page in every paper for a week. We had press conferences that were covered by all sorts and that went around the world. I was getting phonecalls from friends of mine who were working in India and Australia saying they saw me on the television. I pulled up to a filling station in Clonmel one evening to get petrol and five or six people came over to me out of nowhere as I was filling the car. They were going, "What's happening? Will you get him back?" Then you know it's big, you know that everything's gone mad. The phone never stopped all week. The media had a craving for every piece of information, the public was dying to know what was going on. There were efforts from lots of people to get it sorted and to get him back over there but it was killed stone dead once the players released the statement. That was the final moment when everybody understood that it was over. There were loads of offers [of jets to fly Keane back]. There were offers from senior politicians like the Taoiseach of the time, there were offers from wealthy individuals. People were getting in contact to see could they help the situation. The country wanted him back at the World Cup and there were people who genuinely wanted to assist if they could. I would say as well that there were one or two who wanted to be seen publicly to assist - if they could be seen to have resolved it, they could have gotten some kudos out of it. It all was a very serious public embarrassment for everyone involved. Nobody can truthfully say they weren't embarrassed by it - not Roy Keane, not Mick McCarthy and definitely not the association. It was a watershed moment for us. Honestly, I look back on it all now with a degree of embarrassment. Absolutely I do. And I would say there's loads of people who feel the same. There were so many rows and bad rows and shouting matches with people. And I look back now and think, 'God, what were we all on like?' I wasn't sitting there thinking there was a book in it. I was too busy getting into fights. I do remember being in certain social situations where you knew that everybody in the whole room was talking about the same thing. I remember being in a pub the night he was sent home and it was like a very big wake or something. The following weekend, when the whole back-and-forth was going on over whether he would apologise or not I was at a christening and it was just more of the same. Everybody was talking about this big thing and the child sort of got baptised as an afterthought. It was madness, nutty stuff. There's loads of it that I just wish wasn't true and that I've denied when people back home have asked me about it. 'Ah sure I just made that up.' But it's all there. The book did okay. It definitely changed my literary context. I'd had collections of poetry published before it so it used to be that if you went on to Amazon and bought a book of mine, you'd get, 'People who bought Conor O'Callaghan books also like books by Paul Durcan' or whoever. Now you get, 'People who bought Conor O'Callaghan books also bought Teddy Sheringham'. I turned on the computer one day and saw that the book was part of a 2-for-1 deal with Robbie Fowler's autobiography. I know it was a big deal back home and people think it should have had a big effect on us as players but you become kind of detached from it. Although you were there, you speak of it almost as if from a distance. People ask what it was like to go through it but Jesus, we're not talking Dallas or Dynasty here. It was one of those things that happened at the time and it was a big deal but we had a pretty big tournament to play after it. It was like, 'Oh Roy's gone', but we had to get on with it then. For us over there, we were aware that it was a big story for everybody else but it was actually pretty banal stuff for us. It was done and dusted pretty quickly. Roy was on his way and we moved on and got ready for the World Cup. People brought it up a fair bit in the immediate aftermath because they were obviously interested in what went on. But genuinely, there isn't a lot to say about it. There never was. I don't give it any thought. I'm bored talking about it to be honest. I don't really have anything new to say. I've been through it a million times over the years and there's just nothing left to say. People bring it up and I bat it away and just shrug. It's pretty much been done and dusted and raked over. It came up in an RTÉ documentary that's on the way - not about Saipan in particular but it was mentioned as part of it. And when we touched upon it I was going, 'Not this again.' I'm boring myself just talking about it, honest to God. All rights reserved. No part of this website may be reproduced, stored in or introduced into a retrieval system, or transmitted, in any form or by any means without prior written permission. No permission will be withheld to any reasonable requests.